Lucy I’m Home From The Club With Some Cigs! 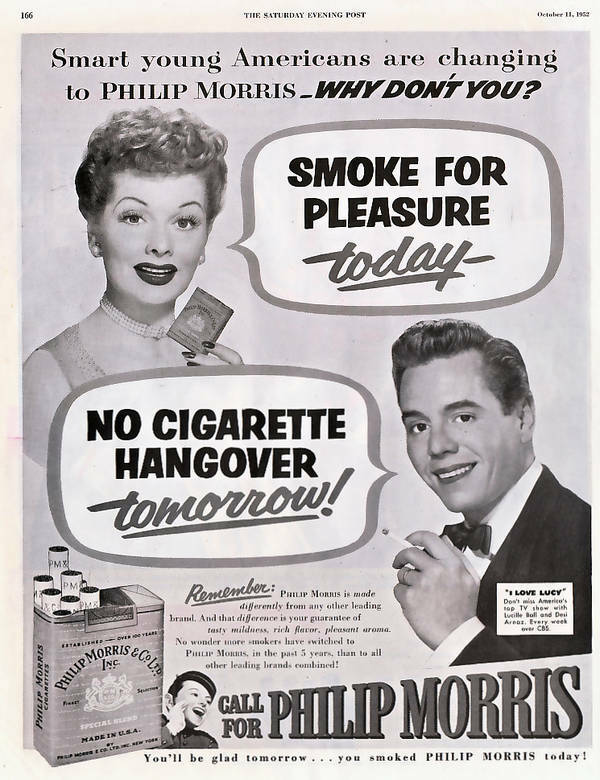 Here's Lucy and Ricky promoting Philip Morris cigs to "smart young Americans" as being free from next-day "cigarette hangovers." How would they live in Manhattan now? The thing about old adverts is that they come out of a context that is, on the one hand, so competitive and on the other hand, so regulated, that even a 60-year-old ad looks like it came from another planet, not just another century. Between the aggressively obvious airbrushing and makeup, the unabashed targeting of cigarettes to young people, and the casual use of the term "cigarette hangover" (I've never heard this before, though I experienced it when I was a smoker), this is as science-fictional as the most extreme moments in Blade Runner or The Fifth Element. Indeed, as others have pointed out, the advertising in those futuristic movies is even more anachronistic than this stuff, since it's just a straight linear extrapolation of today's ads, predicting a world where things are only "more" but not "different."